Tree Removal – Trees not only need to come down but shallow roots also need to be removed from the ground so they do not impede the construction process. Stump Removal – In order to build on a cleared lot, there cannot be any tree stumps remaining anywhere on the ground. Shrub/Bush Removal – Landscaping will need to come down in order to completely clear the lot. This means taking down bushes and shrubs of all sizes. There is a lot more that goes into land and lot clearing than simply taking down the existing trees, bushes and shrubs. There is a strong emphasis on minimizing any damage to the land. That requires a careful and calculated approach to ensure the land will be of adequate use for construction. Everything needs to be uprooted with precision and care. At Tree Works, it is our job to provide builders with an entirely clean slate. Our lot and land clearing service also comes with debris removal. Our team will use a chipper to break down debris and we’ll haul it away as well. There is no job too big or small as we clear small lots for residential homeowners and large pieces of land for real estate developers. 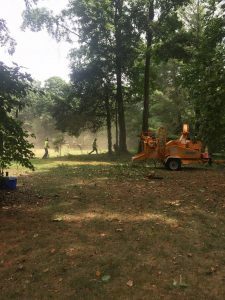 Tree Works brings together all of its services to provide our clients with the best comprehensive land and lot clearing services in Charlotte, NC.